• Symposium on Compositional Structures. The Symposium on Compositional Structures is a new interdisciplinary meeting aiming to support the growing community of researchers interested in the phenomenon of compositionality, from both applied and abstract perspectives, and in particular where category theory serves as a unifying common language. We welcome submissions from researchers across computer science, mathematics, physics, philosophy, and beyond, with the aim of fostering discussion, disseminating new ideas, and spreading knowledge of open problems between fields. Submission is encouraged for both mature research and work in progress, and by both established academics and junior researchers, including students. The meeting does not have proceedings. • industrial applications, including case studies and real-world problem descriptions. Meetings will involve both invited and contributed talks. The first meeting is planned for Autumn 2018, with more details to follow soon. Some funding may be available to support travel and subsistence, especially for junior researchers who are speaking at the meeting. • Ross Duncan, University of Strathclyde. • Chris Heunen, University of Edinburgh. • Aleks Kissinger, Radboud University Nijmegen. • Samuel Mimram, École Polytechnique. • Mehrnoosh Sadrzadeh, Queen Mary. • Pawel Sobocinski, University of Southampton. • Jamie Vicary, University of Birmingham and University of Oxford. 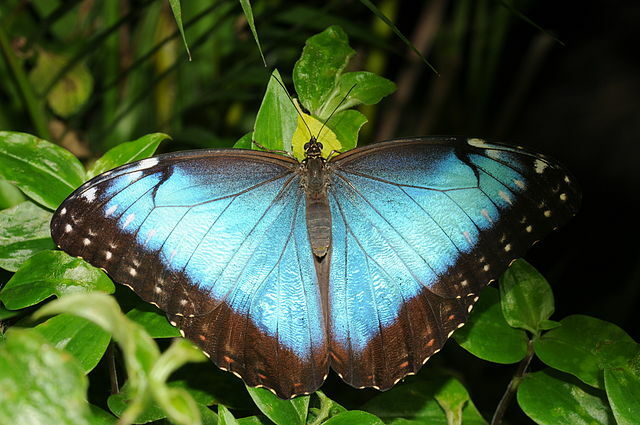 Some butterflies have shiny, vividly colored wings. From different angles you see different colors. This effect is called iridescence. How does it work? It turns out these butterfly wings are made of very fancy materials! Light bounces around inside these materials in a tricky way. Sunlight of different colors winds up reflecting off these materials in different directions. We’re starting to understand the materials and make similar substances in the lab. They’re called photonic crystals. They have amazing properties. Here at the Centre for Quantum Technologies we have people studying exotic materials of many kinds. Next door, there’s a lab completely devoted to studying graphene: crystal sheets of carbon in which electrons can move as if they were massless particles! Graphene has a lot of potential for building new technologies—that’s why Singapore is pumping money into researching it. 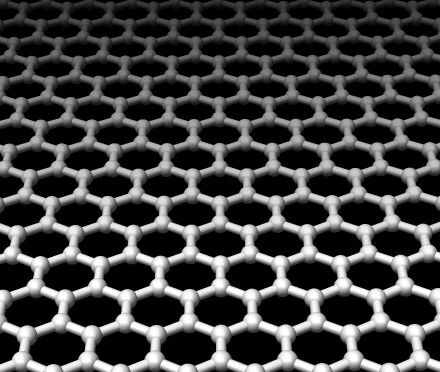 Some physicists at MIT just showed that one of the materials in butterfly wings might act like a 3d form of graphene. In graphene, electrons can only move easily in 2 directions. In this new material, electrons could move in all 3 directions, acting as if they had no mass. The picture at left actually shows a sculpture made by the mathematical artist Bathsheba Grossman. 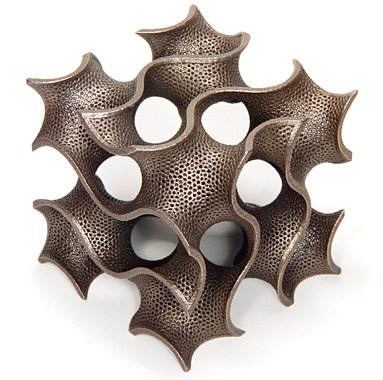 But it’s a piece of a gyroid: a surface with a very complicated shape, which repeats forever in 3 directions. It’s called a minimal surface because you can’t shrink its area by tweaking it just a little. It divides space into two regions. 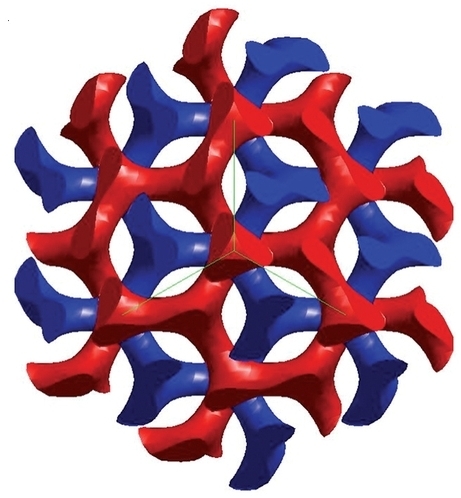 The gyroid was discovered in 1970 by a mathematician, Alan Schoen. It’s a triply periodic minimal surfaces, meaning one that repeats itself in 3 different directions in space, like a crystal. 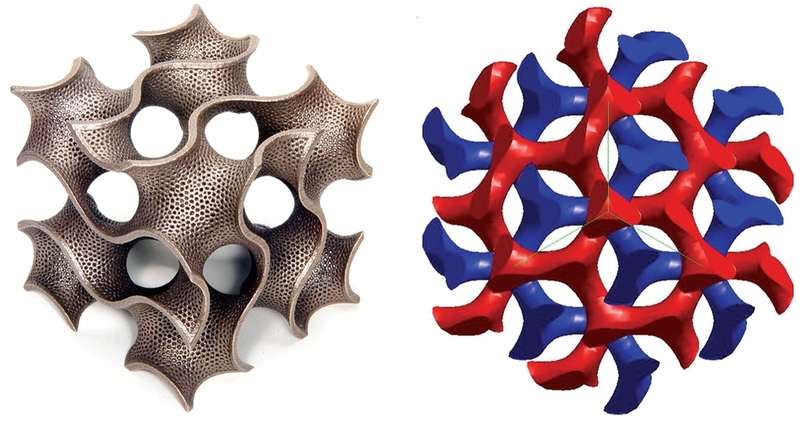 Schoen was working for NASA, and his idea was to use the gyroid for building ultra-light, super-strong structures. But that didn’t happen. Research doesn’t move in predictable directions. In 1983, people discovered that in some mixtures of oil and water, the oil naturally forms a gyroid. The sheets of oil try to minimize their area, so it’s not surprising that they form a minimal surface. Something else makes this surface be a gyroid—I’m not sure what. Butterfly wings are made of a hard material called chitin. Around 2008, people discovered that the chitin in some iridescent butterfly wings is made in a gyroid pattern! The spacing in this pattern is very small, about one wavelength of visible light. This makes light move through this material in a complicated way, which depends on the light’s color and the direction it’s moving. So: butterflies have naturally evolved a photonic crystal based on a gyroid! The universe is awesome, but it’s not magic. A mathematical pattern is beautiful if it’s a simple solution to at least one simple problem. This is why beautiful patterns naturally bring themselves into existence: they’re the simplest ways for certain things to happen. Darwinian evolution helps out: it scans through trillions of possibilities and finds solutions to problems. So, we should expect life to be packed with mathematically beautiful patterns… and it is. for some small value of . It turns out that while they’re still growing, some butterflies have a double gyroid pattern in their wings. This turns into a single gyroid when they grow up! The new research at MIT studied how an electron would move through a double gyroid pattern. They calculated its dispersion relation: how the speed of the electron would depend on its energy and the direction it’s moving. An ordinary particle moves faster if it has more energy. But a massless particle, like a photon, moves at the same speed no matter what energy it has. The MIT team showed that an electron in a double gyroid pattern moves at a speed that doesn’t depend much on its energy. So, in some ways this electron acts like a massless particle. But it’s quite different than a photon. It’s actually more like a neutrino! You see, unlike photons, electrons and neutrinos are spin-1/2 particles. Neutrinos are almost massless. A massless spin-1/2 particle can have a built-in handedness, spinning in only one direction around its axis of motion. Such a particle is called a Weyl spinor. The MIT team showed that a electron moving through a double gyroid acts approximately like a Weyl spinor! Beware: nobody has actually made electrons act like Weyl spinors in the lab yet. The MIT team just found a way that should work. Someday someone will actually make it happen, probably in less than a decade. And later, someone will do amazing things with this ability. I don’t know what. Maybe the butterflies know! • James A. Dolan, Bodo D. Wilts, Silvia Vignolini, Jeremy J. Baumberg, Ullrich Steiner and Timothy D. Wilkinson, Optical properties of gyroid structured materials: from photonic crystals to metamaterials, Advanced Optical Materials 3 (2015), 12–32. • Alan Schoen, Triply-periodic minimal surfaces. • K. Michielsen and D. G. Stavenga, Gyroid cuticular structures in butterfly wing scales: biological photonic crystals. • Vinodkumar Saranathana et al, Structure, function, and self-assembly of single network gyroid (I4132) photonic crystals in butterfly wing scales, PNAS 107 (2010), 11676–11681. • Melissa G. Meadows et al, Iridescence: views from many angles, J. Roy. Soc. Interface 6 (2009). • Ling Lu, Liang Fu, John D. Joannopoulos and Marin Soljačić, Weyl points and line nodes in gapless gyroid photonic crystals. • Ling Lu, Zhiyu Wang, Dexin Ye, Lixin Ran, Liang Fu, John D. Joannopoulos and Marin Soljačić, Experimental observation of Weyl points, Science 349 (2015), 622–624. Two-dimensional (2d) electrons and photons at the energies and frequencies of Dirac points exhibit extraordinary features. As the best example, almost all the remarkable properties of graphene are tied to the massless Dirac fermions at its Fermi level. Topologically, Dirac cones are not only the critical points for 2d phase transitions but also the unique surface manifestation of a topologically gapped 3d bulk. In a similar way, it is expected that if a material could be found that exhibits a 3d linear dispersion relation, it would also display a wide range of interesting physics phenomena. The associated 3D linear point degeneracies are called “Weyl points”. In the past year, there have been a few studies of Weyl fermions in electronics. The associated Fermi-arc surface states, quantum Hall effect, novel transport properties and a realization of the Adler–Bell–Jackiw anomaly are also expected. However, no observation of Weyl points has been reported. Here, we present a theoretical discovery and detailed numerical investigation of frequency-isolated Weyl points in perturbed double-gyroid photonic crystals along with their complete phase diagrams and their topologically protected surface states. Weyl points are topologically stable objects in the 3d Brillouin zone: they act as monopoles of Berry flux in momentum space, and hence are intimately related to the topological invariant known as the Chern number. The Chern number can be defined for a single bulk band or a set of bands, where the Chern numbers of the individual bands are summed, on any closed 2d surface in the 3d Brillouin zone. The difference of the Chern numbers defined on two surfaces, of all bands below the Weyl point frequencies, equals the sum of the chiralities of the Weyl points enclosed in between the two surfaces. This is a mix of topology and physics jargon that may be hard for pure mathematicians to understand, but I’ll be glad to translate if there’s interest. For starters, a ‘monopole of Berry flux in momentum space’ is a poetic way of talking about a twisted complex line bundle over the space of allowed energy-momenta of the electron in the double gyroid. We get a twist at every ‘Weyl point’, meaning a point where the dispersion relations look locally like those of a Weyl spinor when its energy-momentum is near zero. Near such a point, the dispersion relations are a Fourier-transformed version of the Weyl equation. There’s going to be a workshop on quantum network theory in Berkeley this June. The event is being organized by some of my collaborators and will be a satellite of the biggest annual network science conference, NetSci. A theme of the Network Theory series here on Azimuth has been to merge ideas appearing in quantum theory with other disciplines. Remember the first post by John which outlined the goal of a general theory of networks? Well, everyone’s been chipping away at this stuff for a few years now and I think you’ll agree that this workshop seems like an excellent way to push these topics even further, particularly as they apply to complex networks. The event is being organized by Mauro Faccin, Filippo Radicchi and Zoltán Zimborás. You might recall when Tomi Johnson first explained to us some ideas connecting quantum physics with the concepts of complex networks (see Quantum Network Theory Part 1 and Part 2). Tomi’s going to be speaking at this event. I understand there is even still a little bit of space left to contribute talks and/or to attend. I suspect that those interested can sort this out by emailing the organizers or just follow the instructions to submit an abstract. They have named their event Quantum Frontiers in Network Science or QNET for short. Here’s their call. This year the biggest annual network science conference, NetSci will take place in Berkeley California on 2-6 June. We are organizing a one-day Satellite Workshop on Quantum Frontiers in Network Science (QNET). A grand challenge in contemporary complex network science is to reconcile the staple “statistical mechanics based approach” with a theory based on quantum physics. When considering networks where quantum coherence effects play a non-trivial role, the predictive power of complex network science has been shown to break down. A new theory is now being developed which is based on quantum theory, from first principles. Network theory is a diverse subject which developed independently in several disciplines to rely on graphs with additional structure to model complex systems. Network science has of course played a significant role in quantum theory, for example in topics such as tensor network states, chiral quantum walks on complex networks, categorical tensor networks, and categorical models of quantum circuits, to name only a few. However, the ideas of complex network science are only now starting to be united with modern quantum theory. From this respect, one aim of the workshop is to put in contact two big and generally not very well connected scientific communities: statistical and quantum physicists. The topic of network science underwent a revolution when it was realized that systems such as social or transport networks could be interrelated through common network properties, but what are the relevant properties to consider when facing quantum systems? This question is particularly timely as there has been a recent push towards studying increasingly larger quantum mechanical systems, where the analysis is only beginning to undergo a shift towards embracing the concepts of complex networks. For example, theoretical and experimental attention has turned to explaining transport in photosynthetic complexes comprising tens to hundreds of molecules and thousands of atoms using quantum mechanics. Likewise, in condensed matter physics using the language of “chiral quantum walks”, the topological structure of the interconnections comprising complex materials strongly affects their transport properties. An ultimate goal is a mathematical theory and formal description which pinpoints the similarities and differences between the use of networks throughout the quantum sciences. This would give rise to a theory of networks augmenting the current statistical mechanics approach to complex network structure, evolution, and process with a new theory based on quantum mechanics. QNET will be held at the NetSci Conference venue at the Clark Kerr Campus of the University of California, on June 2nd in the morning (8am-1pm). From the call, we can notice that a central discussion topic at QNET will be about contrasting stochastic and quantum mechanics. Here on Azimuth we like this stuff. You might remember that stochastic mechanics was formulated in the network theory series to mathematically resemble quantum theory (see e.g. Part 12). This formalism was then employed to produce several results, including a stochastic version of Noether’s theorem by John and Brendan in Parts 11 and 13—recently Ville has also written Noether’s Theorem: Quantum vs Stochastic. Several other results were produced by relating quantum field theory to Petri nets from population biology and to chemical reaction networks in chemistry (see the Network Theory homepage). It seems to me that people attending QNET will be interested in these sorts of things, as well as other related topics. One of the features of complex network science is that it is often numerically based and geared directly towards interesting real-world applications. I suspect some interesting results should stem from the discussions that will take place at this workshop. • Network Theory I: electrical circuits and signal-flow graphs. Click on items in blue, or pictures, for more information. One reason I’m glad I gave this talk is because afterwards Jamie Vicary pointed out some very interesting consequences of the relations among signal-flow diagrams listed in my talk. It turns out they imply equations familiar from the theory of complementarity in categorical quantum mechanics! This is the kind of mathematical surprise that makes life worthwhile for me. It seemed utterly shocking at first, but I think I’ve figured out why it happens. Now is not the time to explain… but I’ll have to do it soon, both here and in the paper that Jason Eberle are writing about control theory. • Brendan Fong, A compositional approach to control theory. Quantum mechanics forces us to refine our attitude to counterfactual conditionals: questions about what would have happened if we had done something, even though we didn’t. “What would the position of the particle be if I’d measured that… when actually I measured its momentum?” Here you’ll usually get no definite answer. But sometimes you can use quantum mechanics to find out what would have happened if you’d done something… when classically it seems impossible! Suppose you have a bunch of bombs. Some have a sensor that will absorb a photon you shine on it, and make the bomb explode! Others have a broken sensor, that won’t interact with the photon at all. Can you choose some working bombs? You can tell if a bomb works by shining a photon on it. But if it works, it blows up—and then it doesn’t work anymore! So, it sounds impossible. But with quantum mechanics you can do it. You can find some bombs that would have exploded if you had shone photons at them! Put a light that emits a single photon at A. Have the photon hit the half-silvered mirror at lower left, so it has a 50% chance of going through to the right, and a 50% chance of reflecting and going up. But in quantum mechanics, it sort of does both! Put a bomb at B. Recombine the photon’s paths using two more mirrors. Have the two paths meet at a second half-silvered mirror at upper right. 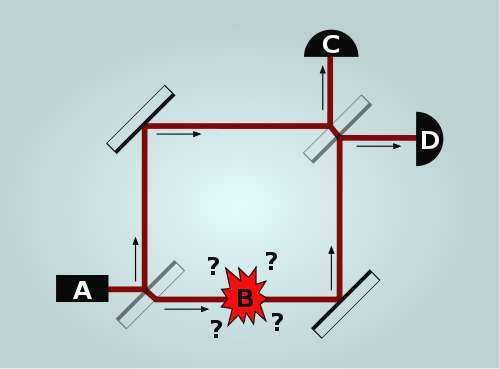 You can make it so that if the bomb doesn’t work, the photon interferes with itself and definitely goes to C, not D.
But if the bomb works, it absorbs the photon and explodes unless the photon takes the top route… in which case, when it hits the second half-silvered mirror, it has a 50% chance of going to C and a 50% chance of going to D.
• If the bomb doesn’t work, the photon has a 100% chance of going to C.
• If the bomb works, there’s a 50% chance that it absorbs the photon and explodes. There’s also a 50% chance that the bomb does not explode—and then the photon is equally likely to go to either C or D. So, the photon has a 25% chance of reaching C and a 25% chance of reaching D.
So: if you see a photon at D, you know you have a working bomb… but the bomb has not exploded! • a 25% chance that it doesn’t explode but you can tell that it works. This is the Elitzur–Vaidman bomb-testing method. It was invented by Avshalom Elitzur and Lev Vaidman in 1993. One year later, physicists actually did an experiment to show this idea works… but alas, not using actual bombs! In 1996, Kwiat showed that using more clever methods, you can reduce the percentage of wasted working bombs as close to zero as you like. And pushing the idea even further, Graeme Mitchison and Richard Jozsa showed in 1999 that you can get a quantum computer to do a calculation for you without even turning it on! This sounds amazing, but it’s really no more amazing than the bomb-testing method I’ve already described. • A. Elitzur and L. Vaidman, Quantum mechanical interaction-free measurements, Found. Phys. 23 (1993), 987–997. • Paul G. Kwiat, H. Weinfurter, T. Herzog, A. Zeilinger, and M. Kasevich, Experimental realization of “interaction-free” measurements. • Paul G. Kwiat, Interaction-free measurements. • Graeme Mitchison and Richard Jozsa, Counterfactual computation, Proc. Roy. Soc. Lond. A457 (2001), 1175–1194. • Elitzur–Vaidman bomb tester, Wikipedia. • Robert Furber and Bart Jacobs, Towards a categorical account of conditional probability. All these people are already at Oxford, so you may wonder what’s new about this center. I’m not completely sure, but they’ve gotten money from EPSRC (roughly speaking, the British NSF), and they’re already hiring a postdoc. Applications are due on March 11, so hurry up if you’re interested! They’re having a conference October 1st to 4th to start things off. I’ll be speaking there, and they tell me that Steve Awodey, Alexander Beilinson, Lucien Hardy, Martin Hyland, Chris Isham, Dana Scott, and Anton Zeilinger have been invited too. I’m really looking forward to seeing Chris Isham, since he’s one of the most honest and critical thinkers about quantum gravity and the big difficulties we have in understanding this subject—and he has trouble taking airplane flights, so it’s been a long time since I’ve seen him. It’ll also be great to see all the other people I know, and meet the ones I don’t. I’m not as big on n-categories and quantum gravity as I used to be, but I’m still interested in the foundations of quantum theory and how it’s connected to computation, so I think I can give a talk with some new ideas in it. Here at U.C. Riverside, Alexander Korotkov wants to hire a postdoc in quantum measurement and quantum computing with superconducting qubits. The work will be mainly related to quantum feedback of superconducting qubits. The first experiment was published in Nature today. (Some News & Views discussion can be seen here.) The theory is still rather simple and needs improvement. You are currently browsing the archives for the quantum technologies category.